Please let me know if you find any links that are not working. Have you ever been walking in the woods and come across a group of tombstones. They were probably overgrown with weeds, some of them maybe even broken. Did you wonder why they were there? Who were they, why were they buried in this lonely place ? Was this an old homesite, the remains of an old town, were they just travelers killed on their journey? Someone loved these people and cared enough to mark their graves. They were people just like us once. Should their graves just be left to disappear? If we don't preserve their history, who will preserve ours? People often ask me why I photograph cemeteries that are not "abandoned". These 2 photos are actually the same tombstone. All cemeteries should be documented before these treasures are lost forever. 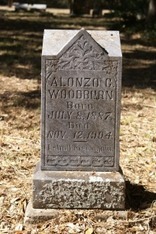 We have tried to list as many cemetery sites as we could find. Unfortunately many of these sites have been visited by vandals and people trying to steal artifacts. For this reason we have not put addresses or directions to these sites. If you need to find a specific site please email us and we will help you get there. We are sorry for the trouble but we are hoping to protect what remains of these historic places. Some of the sites have transcriptions available. Just click on the cemetery name to find this information. If you are looking for an ancestor that was buried in Hernando County prior to 1992 but you are unsure which cemetery they are in, email me with their name and I might be able to help you. Not all of the sites listed are abandoned. We have listed them in the hopes of preserving the information they contain. Unfortunately, even many of the largest sites, are not currently listed on the FMSF. This means that someday they may end up like the abandoned sites we find today. Some of the worst sites today were beautiful well kept cemeteries 50 years ago. We are a volunteer organization and the only way we have to raise funds is by the sale of our photos. If you would like a copy of one of these photos please contact us. We can make photos in any size even poster size. We can also make mugs, t-shirts etc. If you know of a cemetery that needs our help, or have information about one of these historic places, please contact us. We are looking for as much background information on these sites as we can find.